MSRP (CAD): Please contact us for pricing information. 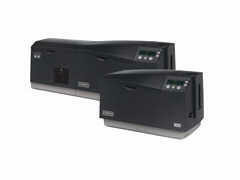 DTC550 combines reliable ID card printing with networking capabilities for secure issuance throughout the enterprise. Flexible design for centralized or distributed ID card issuance in large corporations, service bureaus or large educational institutions. Optional Ethernet connectivity and internal print server integrates with existing enterprise networks. Wide range of features and options for security, productivity, easy management and operation.